After deciding to get an inflatable kayak, a new question arose. How to transport it? It comes with a carrying bag, but carrying 20 kilos around is not much fun. I looked into various solutions: suitcases with wheels, shopping trolleys, hand trucks and also bicycle trailers. Suitcases have tiny wheels and are big and heavy. Even duffel bags with wheels seem awkward. Hand trucks can be cheap but all that I saw were either flimsy or heavy. The shopping trolleys all seemed rather flimsy. The only exception was the Andersen Royal (Plus) which seems to be a decent quality. Andersen even sells a kit to use it as a bicycle trailer. But That system requires all kinds of weird attachments to be added to your bicycle. You also need to upgrade to air tires with ball bearings to prevent it from bouncing around, and then it gets quite expensive. A bicycle trailer seemed more practical. Useful for hauling around other stuff and groceries as well. 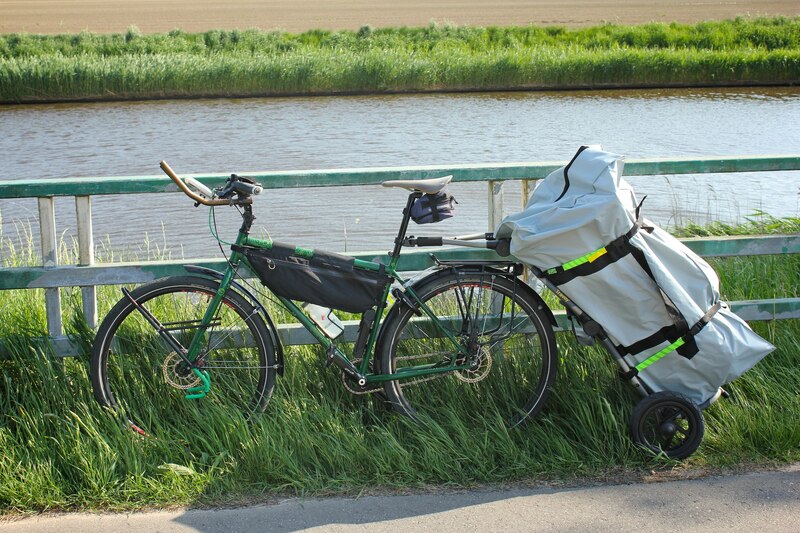 There are many bicycle trailers out there. Many of them for carrying children or dogs, some of them for luggage and cargo. You would think that a bicycle trailer would cost a fraction of a bicycle, unfortunately this is often not true. 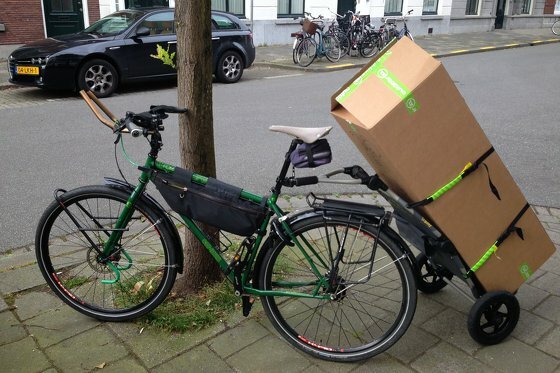 A quality trailer can cost as much as a quality bicycle. For me the criteria were that I wanted to carry a 17 kilo kayak, around. Either by bicycle, or walking around. I considered getting two different systems for that, since these are two different use cases. Additionally I needed to be able to carry the carrier inside the kayak, the smaller and lighter the better. The Burley Travoy came into the picture pretty early. 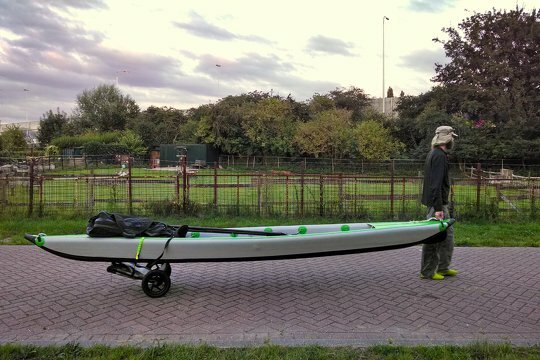 It can be used as a bicycle and walking trailer and folds up just small enough to fit in my kayak. But it's big and heavy for a walking trailer, and one issue was the wheels rubbing the cargo. I tried looking for something better, but could not find anything that came close. After giving it a lot of thought I came up with an idea to construct a wheel guard, should the rubbing be a problem for me. If I ever make it, I will add it to this page. I was ready to buy, visited various bike shops and has a disappointing retail experience. In The Netherlands where people haul around kids, pets, groceries and surfboards on bicycles you can get cargo bikes and trailers pretty easily, but Burley products are nowhere to be found. The online shops that offered it for a decent price didn't have it in stock for weeks. I eventually ordered it online from Germany where it was even cheaper, including shipping. 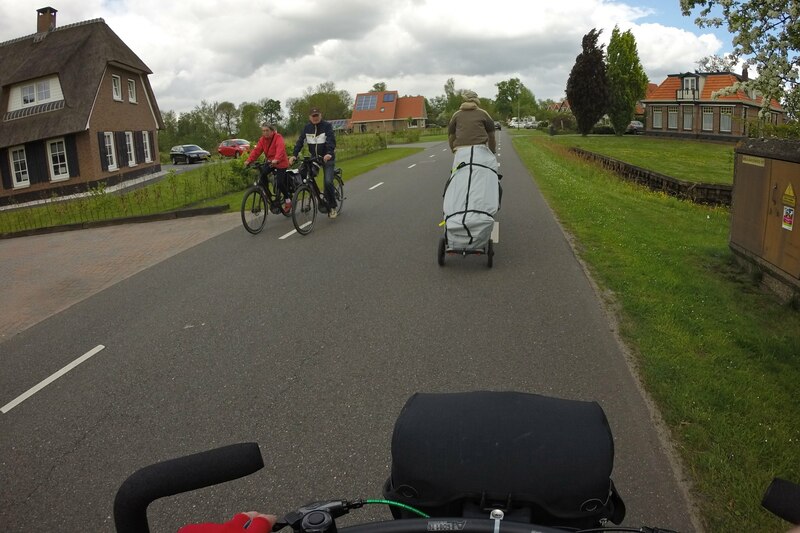 A bicycle trailer greatly increases the cargo capacity of a bicycle. 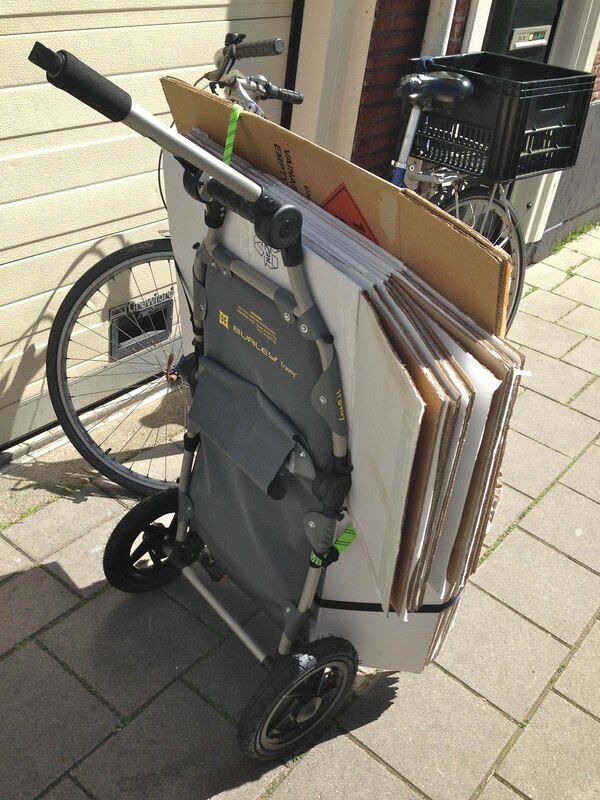 Travoy loaded with a box that is 120 × 40 × 40 centimeters in size. Anything taller would need to be more upright to prevent it touching the cyclist. 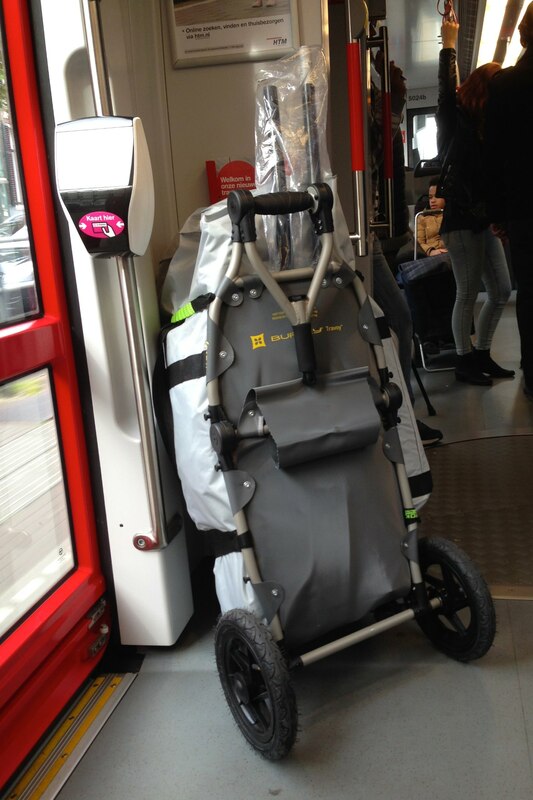 In the tram with an inflatable kayak and peddles. The trailer arrived in a small box, but once I pulled it out I was surprised by the weight. I had lifted shopping trolleys in the shops before, and this thing was definitely bigger and heavier than those. Putting it together was easy. I was impressed by how little effort is required to snap on the wheels. Twisting the handles to fold it out is not totally obvious, but once you get it it's easy enough. Since I had already read many reviews there were not many more surprises. Even though there was no air in the tires it was surprisingly smooth to walk around with. Using it indoors is not very convenient with the wide wheels. Before buying I was afraid of the wheels rubbing, and wished they were wider, but they seem wide enough. I had already read so much about the Burley Travoy that I had a pretty good idea what I was getting. Of course I wish it had been cheaper and lighter, but there is no other similar product that comes close to the Burley Travoy, they all have other major flaws, higher weights and prices. The Travoy has been on the market since 2011, and has not been updated since. It received many positive reviews, but they often mention the same drawbacks. After five years it's about time Burley made an updates version. The first weak point is the included tote bag. It's floppy and rubs the wheels if you don't fill it up in a particular way. For the wheel rubbing there should be an optional fender kit. The bag also does not close. It just has some velcro on the top in the middle to keep both sides together. Not strong enough to keep the trailer in when you hold it upside down. Smaller items will just roll out through the holes. A better closing system would make the bag so much better. There is a bungee cord that can be tightened, but it seems pretty useless. Some leeches for tying down more things, like a bicycle light or a strap to properly close the bag would be more useful. A shoulder strap exists as a separate accessory but should be included. The included straps are as basic as it gets, it would not be too hard to come up with something better. The reflectors on the bottom are only visible from directly behind, at large distance and low perspective. It seems like an afterthought. I plan to replace them with reflective tape which will save weight and be visible from more directions. 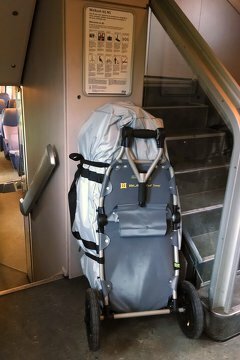 Like said before, the trailer is the lightest in its class, nevertheless it would be interesting to see if the weight could be reduced even further. 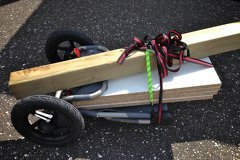 On their own website Burley states that the weight limit is mostly due to the handling of the trailer with a bicycle. The trailer itself can carry more weight. This suggests that the trailer could be made lighter with the same maximum weight capacity. One obvious candidate for weight reduction would be the canvas. It seems unnecessarily thick and covers the whole trailer. A lighter material, reinforced at the proper places would probably work just as well. Other parts of the construction, including the wheels could probably be made lighter. The big wheels make it nearly effortless to move the Travoy around, it feels very agile. You can carry it with the hitch folded down, and with the hitch folded out. With the hitch down you take up less space, which is better in crowded area sand indoors. I have long legs and take big steps, a wheel keeps hitting my heel, even when trying to be constantly aware it happens. It also lifts up the wheel and tilts the trailer. it's much more comfortable to walk with the Travoy with the hitch unfolded, there is foam around the bar, and you can hold other parts of the frame too for a more ergonomic grip without constantly bumping into your heels. I installed the hitch on my seat post as low as I could, in order to keep the center of gravity low for a more stable ride. Going going down the street unloaded I found that even with my large wheels and rear rack I had just enough clearance so that the trailer can make sharp turns. The first real job was picking up a pile of empty moving boxes across town. Using ROK straps I strapped the trailer on my rear rack, which was very secure. The easiest way to get the boxes on there was to lay down the trailer, so that gravity would help. The 150 cm ROK Straps were barely long enough to wrap around the boxes and I had to use the smaller straps to secure the boxes further. The Travoy's kickstand turned out to be useful as an additional lashing point. The boxes were sticking out from both sides, and keeping them clear of the tires required some effort, but the long ROK Straps proved useful. I did not use Burley's straps. 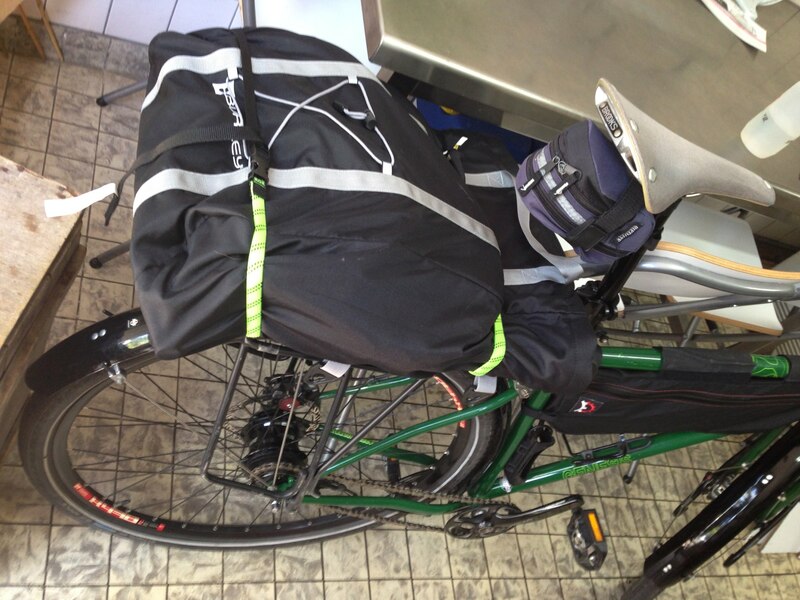 Travoy in its bag strapped to rear rack. The next job for the trailer was transporting a large rectangular box with a trash can in it. Again, I strapped it on top of my rack, to get there using the small ROK Straps. I used one ROK Strap and one Burley strap to secure the box. They are both 1 meter, and were both barely long enough. The Burley strap could not be tightened very much without squeezing the box. While riding I heard the box bouncing around. After my arrival it seemed like the Burley strap has loosened a little and the box was able to bounce around a little. The ROK Strap had kept the bottom firmly in place. Travoy loaded with boxes standing up on its own using the kickstand. The boxes had to be folded for extra clearance around the wheels. I also had my Ortlieb Office-bag with me. Having it on the right side of the rack did not work. It fit with the trailer straight behind me, but it touched when turning right. I don't know if it would tip the trailer, or just be annoying. The best solution I could come up with at the spot was to put to reverse the bag by mounting it on the left side with the hooks slid all the way back so that the bag itself would move forward. I had to move my foot to the middle of the pedal because my heels were touching it otherwise, not ideal, but good enough to get me home. Lesson learned: do not use the Burley Travoy with the Office-bag. Carrying a box that is 30 × 30 × 90 cm. The pannier had to be moved from its current position. The third haul was the moment of truth; picking up my inflatable kayak. The kayak was delivered from China at an importer halfway across the country. After taking the train it was about 25 kilometers cycling from the train station. The Burley Travoy was folded up and strapped down on my rear rack. There were some gravel paths and strong headwinds, but the ROK straps kept it secure. When picking up the kayak the man there thought I was kidding when I arrived by bicycle. Once removed from the box, the kayak and all its accessories were fitted in a large bag that measured 110 × 60 × 35 centimeters and weighed a little over 22 kilos in total. The 150 centimeter long ROK Straps were just long enough to secure the load. I did not bother trying the Burley straps. The ROK Straps have a loop that can go around the latching point in the Travoy. When the load is too wide, they slip off. That is why the bottom strap came loose quickly after loading it up. 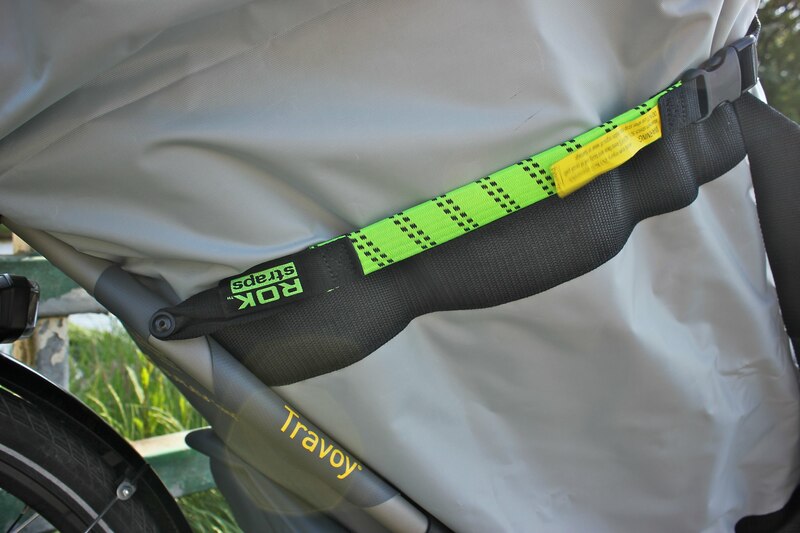 The solution was to wrap the loops around the frame of the Travoy. Spread over two days we cycled about 50 kilometers with the loaded trailer. I was worried about it tipping over, but that never happened, even on bumpy stretches or going through patches of grass. I was riding extra carefully, slowing down over bumps and trying to avoid having one of the trailer's wheels going through a pothole. Pedaling requires extra effort, especially on inclines the extra weight was noticeable. Handling of the bicycle was very good. 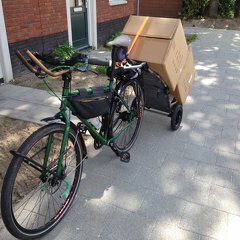 I did feel like the trailer is very wide at the back, but at 40 centimeters it is less wide than a bicycle's handlebar. Looking straight at it, the trailer looks very narrow. Overall I was impressed that it never came close to tipping over. 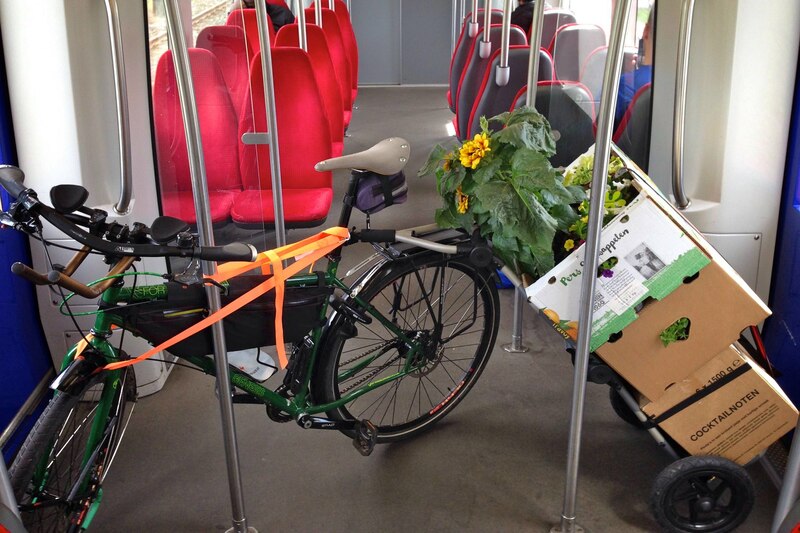 One thing that did disappoint me is that I couldn't use the trailer as a stand for the bicycle. The hitch twists, and the bicycle and carrier both fall over. I still had to lean at least the bicycle against something solid. On the way back in the train the Travoy was leaning against a wall, with the heavy load it was not too stable and shifted around while the train moved, but it never tipped over. Even with a large 22 kilo load the Travoy did not tip over. The trailer is not any wider than the bicycle. The reflectors are barely visible from this distance. Wheel clearance, rear reflectors and kickstand. The Travoy leaning in a corner of the train. ROK strap around Travoy's latching point. More secure way of attaching a ROK Strap is by looping it around the frame. After moving into a new house the trailer turned out even more useful than I ever imagined. The trailer significantly increased my carrying capacity. I hauled four dining room chairs at one time. Getting gravel for the yard was a good moment to test the capacity. Two bags weighed 50 kilos in total. This exceeds the maximum capacity by 23 kilos. The trailer was flexing significantly and was jerking the bicycle while cycling. Coming to a stop on a downward slope was problematic. 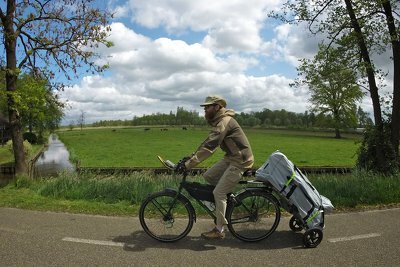 The trailer would push the bicycle and the rear wheel (50 mm Schalbe Big Apple tire) would lose traction and be pushed to the side. The same thing happened when carrying a bag of concrete of just 25 kilos, just under the weight limit. At one point I had to make an emergency stop and the rear wheel lost traction and was pushed aside. For a moment it seemed like the bicycle was going to fall over, but I barely managed to keep it of the ground. You are in no way limited to the bags that Burley sells for the Travoy, you can put any bag, suitcase, box or container on there, as long as it fits, stays under the weight limit and can be secured. 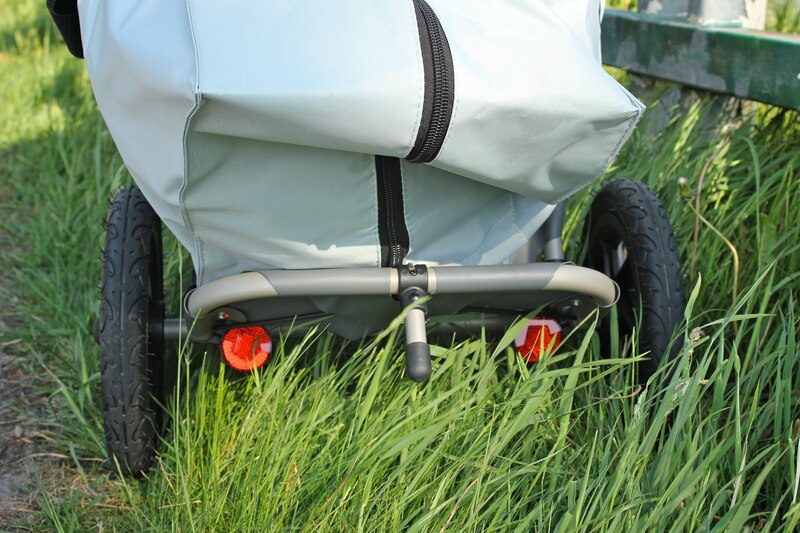 The straps that come with the Burley Travoy are adjustable in length up to 100 centimeters and do not stretch. 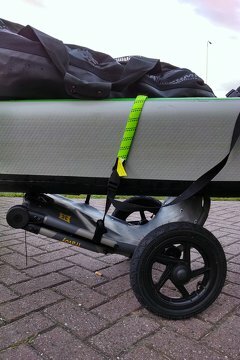 There are plenty of ways to add your own straps and bungees which can be longer, or elastic to secure the cargo better. You can even attach them vertical or diagonal. I got some ROK Straps to secure large loads, which work much better than the originals. To prevent the trailer from tipping over you can ride slower lower the center of gravity. You can do this by redistributing the load by putting heavier items on the bottom. Another way is to lower the hitch on your seat post so that the trailer will be at a lower angle. Mounting the hitch even lower, for example on your luggage carrier would lower the center of gravity even more. When walking with the Travoy, or if you have enough clearance with your bicycle you can increase the capacity of the trailer by attaching the bag on the front of the trailer, and add more cargo on the back. Hold your bicycle straight (level) when unhitching the Travoy, otherwise the twisting of the hitch makes adds more friction. 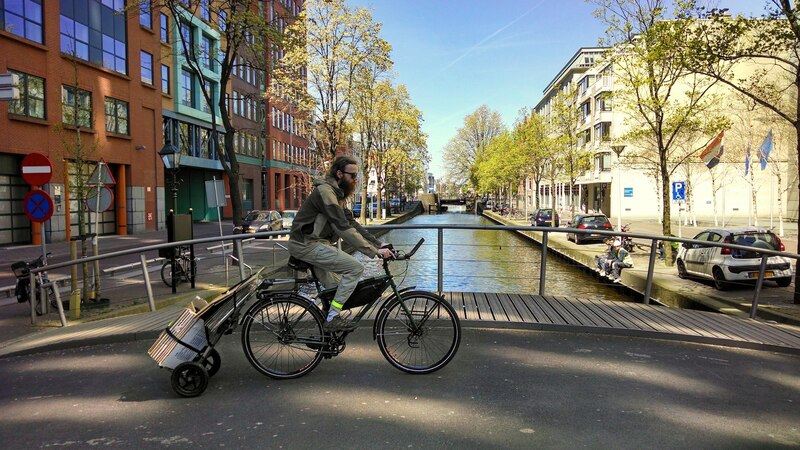 Always extend the kickstand of the Burley Travoy before unhooking it from your bicycle. Without having it extended.You cannot set the Travoy down, which is very annoying when you need to secure your bicycle. There is no way to lock the trailer to the bicycle using the hitch. To lock the trailer, unhook it and place it closer to bicycle so you can loop a lock/chain through both. You can use the Burley Travoy as a bicycle stand by swiveling it to the side when connected to the hitch. This will keep both the trailer and the bicycle upright, but only when the trailer is not to heavily loaded. The reflectors can be removed, and attached somewhere on the tubes above the wheels. Or save weight and leave them out. 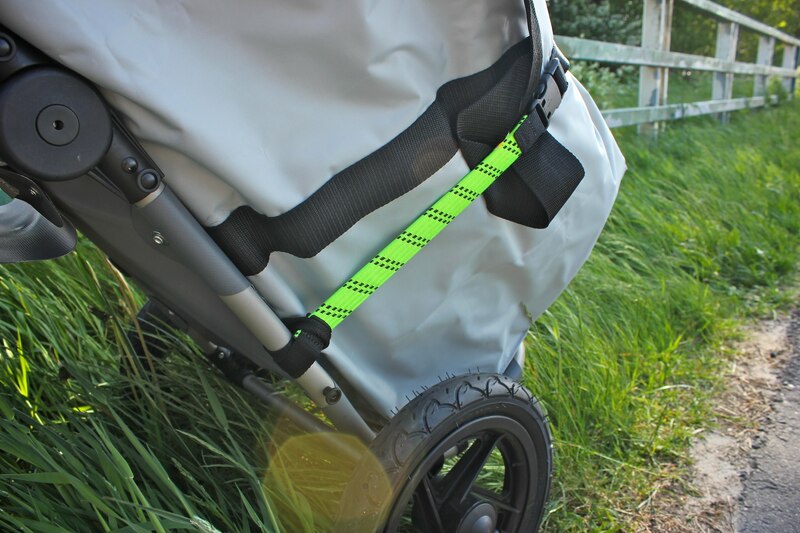 You can add reflective stickers which weigh less and are visible from the side. You can even strap a light on whatever cargo you are carrying. The tires can be replaced. They are 12.5" bicycle tires also commonly found on tiny children's bicycles. Don't get tires with knobs, they will add rolling resistance but will not provide any extra grip. Use slick tires. Some tires have reflective strip for added visibility. Like for example the Schwalbe HS140 12.5" tire on Amazon.com. Keep a spare tube around, especially if you are going on longer trips with the Burley Travoy. If you get a flat tire you can maybe patch it, but if not you have a problem. A 12.5" tube is small and light to take! If the trailer is bouncing around, lower the tire pressure. If you are carrying a heavy load, add some extra air to keep them rolling smoothly. The Burley Travoy is a versatile trailer that allows me to carry large loads with less effort both walking and by bicycle. The best thing about the supplied straps is that they are better than nothing. The kickstand is hard to fold in and out, it's time Burley makes some improvements. 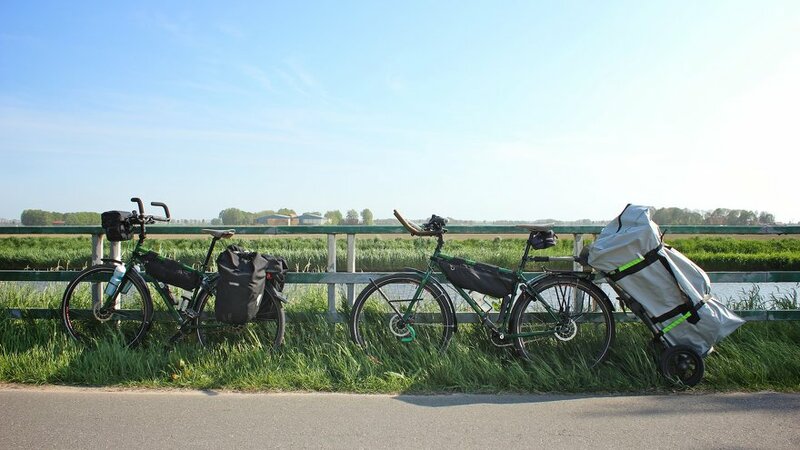 At the same time there are no other bicycle trailers that come close to the features that the Travoy has to offer. 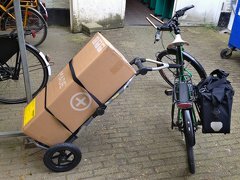 The trailer itself will hold up under heavier loads, the bicycle handles well with loads of 25 kilos, but emergency stops become problematic. The Burley Travoy can also be used as a boat trolley. Partially unfolded the trailer can be used to support large flat loads. 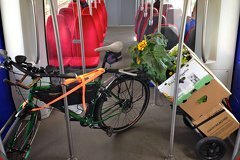 Bringing home live flowers in the metro. Four dining room chairs, note the small box to create the needed tire clearance. Folded down the trailer is useful with large items strapped on. 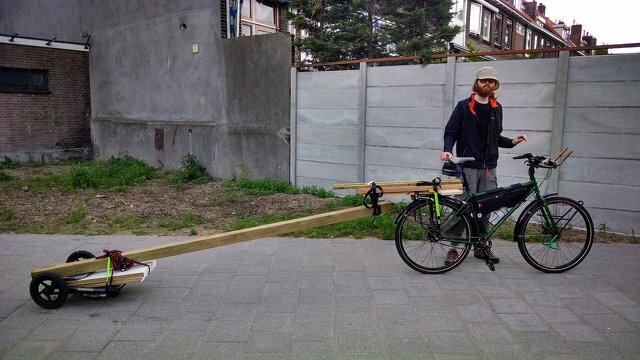 Transporting a 3 meter long wooden pole by bicycle is not something you want to do every day, but with the Burley Travoy it is certainly possible.